Professor Julie Bernhardt AM is a clinician researcher, NHMRC Principal Research Fellow and Senior Principal Florey Research Fellow at the Florey Institute of Neuroscience and Mental Health, Melbourne. Julie has been working with people with stroke for 30 years. She is Co-Head of the Stroke Theme at The Florey and leader of the AVERT Early Intervention Research Program. Working in a large multidisciplinary team of researchers, the focus of Julie’s group is the development and testing of new, exercise and rehabilitation interventions that aim to reduce the burden of stroke related disability. Julie is Australia’s leading stroke rehabilitation trialist, completing the largest, international trial of early mobility based rehabilitation ever conducted (AVERT), which included over 2000 patients from 5 countries in 2015, with the follow on AVERT-DOSE trial set to commence in 2019. Julie is Director of the new NHMRC Centre of Research Excellence in Stroke Rehabilitation and Recovery that outlines an interdisciplinary program of work from bench (discovery) to bedside (implementation) that aims to transform how we do stroke recovery research in Australia. She spearheads the first Stroke Rehabilitation and Recovery Roundtable, and international consortium of stroke experts who are setting new, agreed standards for recovery research. A further passion of Julie’s to improve the retention of women in science and to foster systemic change that sees more women able to lead and excel. 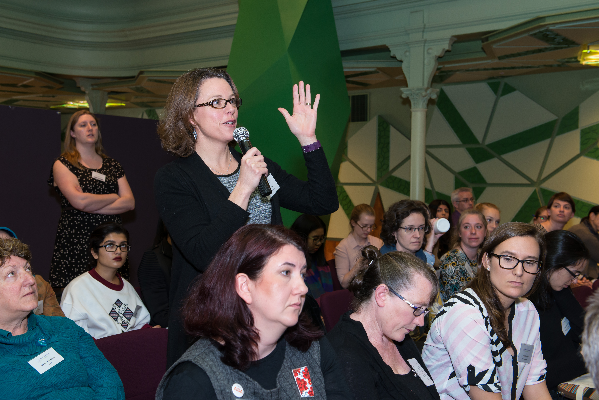 She helped to found the Women in Science Parkville Precinct (WiSPP) collective impact initiative, which is supporting activity and change across 5 of Melbourne’s Medical Research Institutes. Julie was appointed a Member of the Order of Australia (AM) as part of the 2019 Australian Honours. Persistence is the most important trait. Shrug off failure and move on, have a big ambition and just keep plugging away at it. Progress in science is usually incremental and you just need to keep going. What is the one thing you would change to improve the gender balance in senior ranks of scientists? Targets is the one thing I would implement everywhere. Targets in committee representation, targets in fellowship schemes, targets at senior levels. We have seen the benefit of targets on our decision-making committees at my institute. You improve the balance of voices in the room and the conversation changes – pure and simple. The possibility of improvement in the human condition inspires me every day. I want to be part of that, I want to find new ways of doing things, new ways of thinking that will lead to improvements in health care and outcomes for survivors, and improvements in how we conduct science. It is the most powerful driver for me. Successful leaders inspire others to be the best they can be, and take people with them on the journey. What was the key thing that helped you get to where you are today? I am persistent, a finisher, independent in my thinking and I genuinely value the contributions of others, no matter how small, into the big vision – I am good at working out what I don’t know and finding someone to help. I ask lots of questions and I don’t take the kudos very seriously, it’s not why I’m here.